BUFFALO, N.Y. – March 27, 2013 – Mokon’s line of Iceman Low Temperature chillers is now available with operating temperatures from -20°F to +20°F (-29°C to -7°C) and nominal capacities up to 12 Tons in both air and water-cooled condensing. The extreme low temperatures are ideal for jacketed vessels, reactors, laboratory, sanitary and other industrial applications. 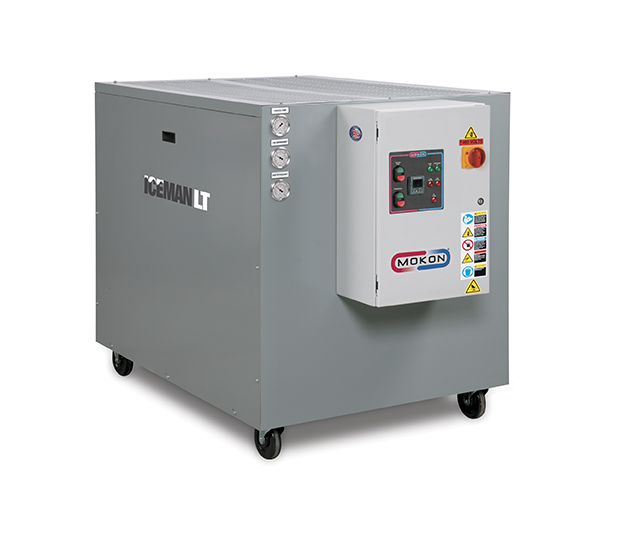 Iceman LT Series portable chillers feature a semi-hermetic discus compressor providing superior energy efficiency, robust operation and easy maintenance. The LT Series comes standard with cylinder unloading/hot gas bypass used for capacity control, increasing the longevity of the compressor. The chillers are green-friendly, utilizing R-507 refrigerant and come with a microprocessor-based controller that ensures stable, straight-line control for extreme accuracy. ABOUT MOKON – For over 55 years, Mokon has set the standard for high quality circulating liquid temperature control systems. Through the development of new products, refinement of existing designs, and our ability to create custom engineered solutions, Mokon has consistently demonstrated its ability to foresee the evolving needs of customers in plastics, packaging, converting, composites, food processing, pharmaceutical, chemical processing, rubber, printing, general processing and many more industries. The company’s product line has grown significantly since it first introduced a water temperature control system in 1955 to include heat transfer oil systems, portable and central chillers, pump tanks, cooling towers, blown film coolers, cold climate coolers, engineered and pre-engineered control panels, maintenance products and custom designed/engineered systems. Mokon’s circulating liquid heating and chilling equipment is proudly designed and manufactured in the USA.